Whether you're travelling near or far, it's nice to travel light. 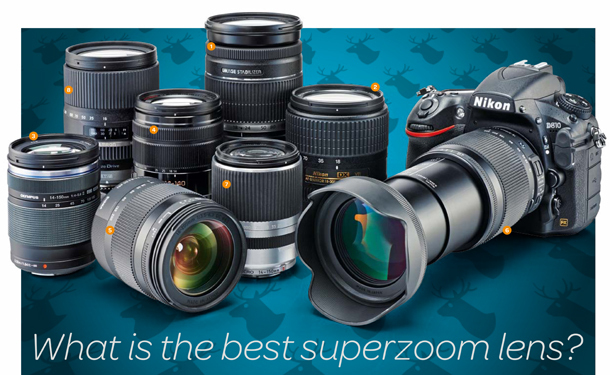 In our search for the best superzoom lens for travel we put 8 space-saving optics head to head. Photography can literally be a pain. If you're exploring a city, rambling around the countryside, or heading to the other side of the world, a weighty bag of cameras, lenses and accessories will soon have you feeling the strain. Wouldn't it be nice if you could get the advanced handling and image quality of a system camera, without the chore of lugging a big collection of kit around with you? That's where superzoom lenses come in. They aim to deliver standard and telephoto zoom capabilities in a single, space-saving package - but it's not just about keeping the size and weight of your gear to a minimum. Superzooms have long been popular for their versatility. It's great being able to react quickly as shooting opportunities arise, zooming from wide-angle to telephoto and everything in between at the flick of a wrist. You'll avoid the frustration of missing shots altogether because you were too busy changing lenses. Another bonus for the digital age is that, without needing to swap lenses on the camera so often, you can greatly reduce the risk of dust and muck being dumped on the image sensor. It's especially true for compact system cameras, where the sensor is in plain sight when changing lenses, rather than being hidden away behind a mirror and shutter assembly. In the downsizing stakes for travel-friendliness, it naturally helps if the host camera is also reasonably compact and lightweight. The biggest competition among superzoom lenses is therefore in APS-C format SLRs, rather than their larger full-frame siblings, and in compact system cameras. The physically smaller image sensors usually fitted to today's CSCs enable lenses to be even tinier. One reason for this is that the image circle the lens needs to produce is relatively small. The second is that the greater crop factor (for example 2.0x for Micro Four Thirds cameras instead of 1.5x or 1.6x for APS-C) means that the actual focal length range tends to be smaller. As a case in point, The Canon 18-200mm APS-C format lens and the Olympus 14-150mm MFT lens both give a similar effective zoom range, equating in 35mm terms to 28.8-320mm for the Canon and 28-300mm for the Olympus. However, while the Canon measures 79 x 102mm and weighs 595g, the Olympus is much smaller at 64 x 83mm and less than half the weight at 285g. There's been some significant weight loss in APS-C format superzooms over the last few years as well. In our last group test of superzooms, we featured the Nikon AF-S DX 18-300mm f/3.5-5.6G ED VR, which we criticised for its podgy proportions of 83 x 20mm and hefty weight of 830g. The newer Nikon AF-S DX 18-300mm f/3.5-6.3G ED VR is a third of a stop slower at the long end of its zoom range, but a much more manageable 79 x 99mm and 550g. A further indication is that the filter thread shrinks from 77mm to 67mm. Even so, the 'slimmer of the year' award goes to Sigma, whose current 18-200mm and 18-250mm lenses (the latter not reviewed this time around) for APS-C format SLRs are much smaller than the original editions, tipping the scales at just 430g and 470g respectively. The 18-200mm featured in this group test measures just 71 x 86mm, so it's barely bigger than most standard zoom lenses for this class of SLR. Some superzoom lenses go all out for zoom range instead of trying to keep size and weight to a minimum. Sigma's latest offering is an 18-300mm lens that gives longer telephoto reach than any of its previous superzooms (not counting the enormous Sigma 50-500mm super-telephoto zoom). Size and weight creep up again to 79 x 102mm and 585g. 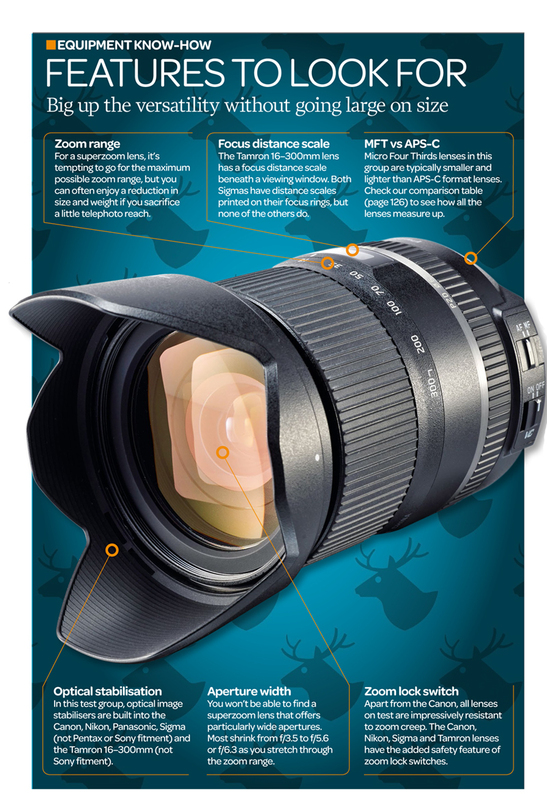 Tamron has a habit of eyeing up the biggest zoom range on the market - then trumping it. The company has struck again with its latest 16-300mm lens for Canon, Nikon and Sony APS-C format SLRs. As well as having a class-leading 18.75x zoom range, it gives greater wide-angle coverage than any other superzoom, with an effective shortest focal length of just 24mm (25.6mm in its Canon fit), whereas most superzooms are equivalent to 28mm at their shortest zoom setting. Getting back to the long end of the zoom range, one perennial problem of telephoto shooting is camera-shake, especially for travel and walkabout shooting, where you may not want to be carrying a tripod around with you. 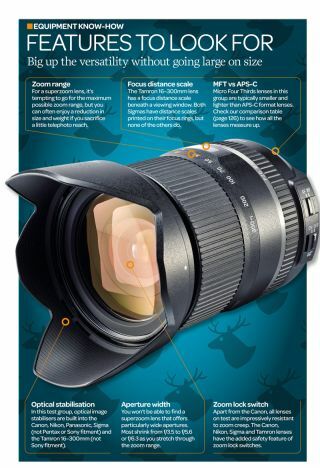 To combat this, all of the Canon-fit and Nikon-fit lenses featured in this group test have optical image stabilisation. Sigma and Tamron both omit the stabiliser from APS-C format superzooms in their Sony-fit option (also Pentax for Sigma), as the host cameras typically have sensor-shift stabilisation built in. The same goes for Olympus Micro Four Thirds cameras, whereas Panasonic bodies often don't have built-in stabilisation. The Panasonic 14-140mm MFT lens on test here therefore includes a Power OIS (Optical Image Stabilizer). We're all used to zoom lenses extending in length as you sweep through the zoom range. However, while extension is often minimal with wide-angle and standard zoom lenses, or non-existent with many constant-aperture zoom lenses, superzooms are a different story. While all of the lenses in this group test are reasonably compact and manageable, to varying extents, they all extend greatly as you zoom from the shortest to the longest available focal length. As a rule of thumb, you can expect a superzoom lens to double in length at its maximum telephoto setting. Add a lens hood as well (sold separately for the Canon and Nikon lenses on test) and the overall length can be more than you bargained for. Despite being outgunned for zoom range by the newer Nikon and Sigma 18-300mm lenses, as well as the Tamron 16-300mm, the Canon is the outright heaviest lens in the group, and the joint biggest along with the Sigma. Launched in 2008, the Canon looks and feels quite dated. There's no focus distance scale and autofocus is based on a simple and fairly noisy electric motor. Unlike Canon lenses that feature ring-type ultrasonic or stepping motor system (the latter adopted in the newer 18-135mm STM lens), the focus ring rotates during autofocus and there's no full-time manual override. On the plus side, the lens features a late-generation image stabiliser that has a four-stop rating and comes complete with automatic panning and tripod detection. Two UD (Ultra-low Dispersion) elements are fitted to combat chromatic aberrations and Super-Spectra coatings are applied to reduce ghosting and flare. Overall build quality feels fairly robust, but the mount lacks a weather-seal ring. It also suffers badly from zoom creep. Autofocus is reasonably quick for an electric motor-driven system and, in our tests, the stabiliser gave a three-stop benefit. Sharpness is below average throughout the zoom range, but there's no major drop-off at the telephoto end. Barrel distortion at the wide-angle end is worse than all others apart from the Tamron 16-300mm, which gives a wider angle of view. 16 elements in 12 groups; six diaphragm blades; closest focus distance, 45cm; 72mm filter thread; electric motor autofocus; 79 x 102mm; 595g. There are currently two Nikon 18-300mm lenses on the market, this newer one having a narrower f/6.3 rather than f/5.6 aperture at the long end of the zoom range. It's also a lot more travel-friendly than the older lens, being smaller and nearly 300g lighter, at 550g. Like most Nikon lenses, this one features a rubber weather-seal ring on its metal mounting plate. It beats the competing Canon lens by featuring ring-type ultrasonic autofocus, which is reasonably quick, very quiet and comes complete full-time manual override. As usual for this type of system, the focus ring doesn't rotate during autofocus. Switches are on hand for auto/manual focus, VR (Vibration Reduction) on and off and zoom lock. We experienced four-stop effectiveness from the VR and, unlike the older Nikon 18-300mm and 18-200mm superzooms, there's no zoom creep. Even so, there's a budget look and feel to the lens, which lacks a focus distance scale and is supplied without a lens hood (sold separately). Despite featuring three ED (Extra-low Dispersion) elements, colour fringing is the second worst in the group. At least in-camera corrections take care of fringing in current and recent Nikon SLRs, when shooting in JPEG mode or processing raw files in Nikon's own software. Sharpness is good at wide to mid zoom settings but drops off a lot at the long end. Distortion levels are pretty average. 16 elements in 12 groups; 7 diaphragm blades; closest focus distance, 48cm; 67mm filter thread; ultrasonic (ring type) autofocus; 79 x 99mm; 550g. Remarkably simple, the Olympus is the only lens in the test group that has no buttons or switches. There's not even one for locking the zoom mechanism, although this isn't a problem as there's no hint of zoom creep. There's no optical image stabiliser either, as it relies on in-camera stabilisation from Olympus Micro Four Thirds bodies. Finally, there's no auto/manual focus switch as this is taken care of by the host camera. The stepping motor autofocus system is optimised for shooting both stills and movies. It's virtually silent, reasonably quick for stills and gives silky smooth transitions when shooting movies. Multi-coatings are applied to all lens elements to keep ghosting and flare to a minimum and, of the three aspherical elements, one is made from ED (Extra-low Dispersion) glass. Compact and lightweight at 64 x 83mm and 285g, the lens has a high-precision feel to its construction, complete with a weather-sealed mount and dust, splash and freeze-resistance. The Olympus beats the competing Panasonic MFT lens for sharpness at wide-angle and mid-zoom settings but drops off at the long end of the zoom range. Sharpness levels are below average, but colour fringing and distortions are complete non-issues on the OM-D E-M1 that we used for testing. For telephoto shooting, we found in-camera stabilisation gave a two-stop advantage, proving less effective than the Panasonic lens's optical stabiliser. 15 elements in 11 groups; seven diaphragm blades; closest focus distance, 50cm; 58mm filter thread; stepping motor autofocus; 64 x 83mm; 285g. Weighing in at just 265g and measuring 75mm in length, this Panasonic lens is even lighter and smaller than the competing Olympus superzoom. It's also slightly shorter in maximum focal length, equivalent to 280mm instead of 300mm on Micro Four Thirds cameras, but adds optical stabilisation. Panasonic claims a 2x improvement in its Power vs Mega optical image stabilisation system, and it's certainly a big advantage over the Olympus and Tamron MFT lenses in the group, which have no optical stabilisation at all. The addition isn't just good news for owners of Panasonic cameras with no built-in stabilisation, as it gives the choice of whether to use optical or sensor-shift stabilisation on other MFT cameras. Build quality feels almost as refined as in the Olympus lens but the Panasonic lacks weather seals. However, it features two ED elements where the Olympus only has one. The stepping motor autofocus system is similarly silent and suitable for stills and movie capture. Like the Olympus and Tamron MFT lenses here, manual focusing is an electronic 'fly-by-wire' affair. There's a dip in sharpness in the middle of the zoom range but it's pretty good at either end. Sharpness in handheld telephoto shots gets a boost from the optical stabiliser, which gives a benefit of about three and a half stops. Tests from our OM-D E-M1 revealed slightly more noticeable distortions than from the Olympus, but well controlled with minimal colour fringing. 14 elements in 12 groups; seven diaphragm blades; closest focus distance, 30-50cm; 58mm filter thread; stepping motor autofocus; 67 x 75mm; 265g.